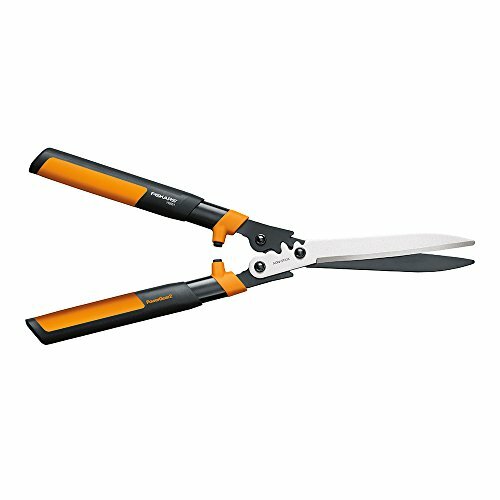 Buzz through outdoor jobs in a hurry with the Fiskars Power Lever Hedge Shears. Serrated edges help the tool stay razor sharp for year after year of use. Dimensions: 2.25W x 6.25D x 20.75H in.. Power-Lever increases cutting power. Serrated edges help grips stems. Shock absorbing bumpers. Hardened stainless steel. Dimensions: 2.25W x 6.25D x 20.75H in. 2-Piece Garden Shear Set: 25" Hedge Clipper + 8" Pruning Shear. For both delicate trimming and heavy pruning, this garden shear set has got you covered. - Blades made of top-class carbon steel. - Hedge Clipper is great for trimming shrubs. - Pruner is ideal for various pruning tasks. - Fully hardened precision-ground steel blades stay sharp longer. -The rust-resistant and low-friction coating makes cutting easier. 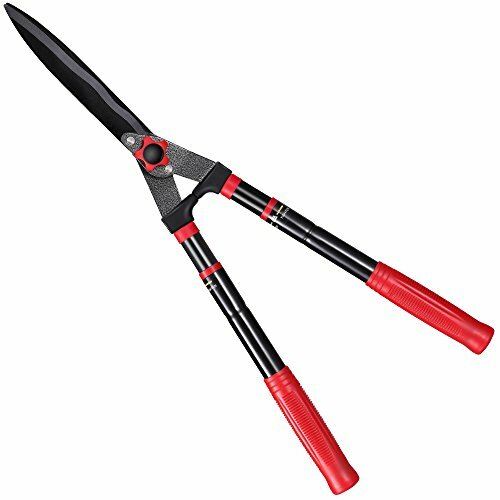 - Non-slip aluminum handles of Pruner are strong, lightweight and comfortable. - Easy-open safety lock of Pruner is convenient and protects blades during transport and storage. - The shock-absorbing bumper of Hedge Shear softens jarring vibrations of abrupt stops and reduces wrist and shoulder pain. 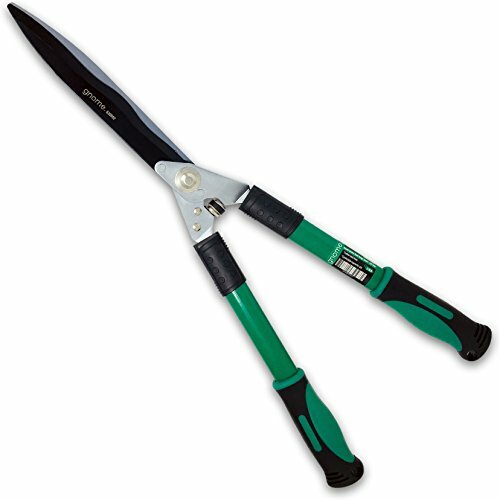 - Pruner can cut up to 3/4" diameter, depend on tree species. 1. Please clean and dry the Shears after use. 2. The blades are sharp, lock the blades and store them in places out of reach of children after use. 3. If you have any question, please feel free to contact us, we will get back to you within 24 hours. 2-Piece Garden Shear Set: 24" Manual Bush Trimmer + 8.3" Pruning Shear. If you're a green hand or a skilled professional who are long for refreshing your garden, this is the perfect set for you. It saves your time, and makes the work efficient. Hedge Clipper CUT EASILY & DURABLE: the sharp & wavy blades make cut through the bushes like butter and keep the twigs from slipping off. It brings clean smooth cuts which are good for plants' health. The blades made of forged carbon steel is strong and durable. Hedge Clipper SAVE EFFORT & EASY USE: steel handle is strong and heavy duty, let you trim thicker shrubs more easily. The soft-grip handles are nonslip and comfortable. The Hand Adjustable Tension Knob & Shock-absorbing Bumper is designed ergonomically. Hand Pruner SHARP BLADE & SAFE STORAGE: precision-ground steel blades with anti-stick coating help blades glide easily through wood, provide a great cutting performance. Safety Lock allows a easy and safe storage. The embedded spring and soft-grip handles are designed to make pruning efficient. 1 Year Warranty with Confidence: Jardineer is devoted to providing reliable & efficient products.Customer satisfaction and service quality are the basic criteria of Jardineer. If you have any problem, please trust us and contact us. We are always available to help. The first time you try our PowerGear2 hedge shears, you ll be amazed but it's not magic, it's gears. Fiskars patented gear technology multiplies your leverage to give you up to 3x more power on every cut. This means you can power through thick branches that traditional hedge shears would struggle to cut. It also means that our hedge shears can be smaller & lighter than other shears, reducing strain on your hands, wrists & muscles when you re reaching to cut a branch or have a lot of hedge shaping to do. 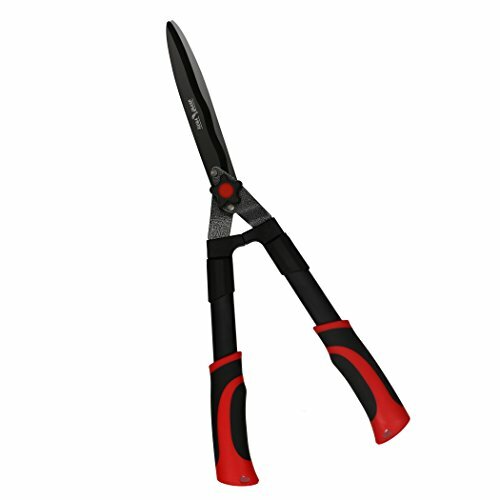 In fact, these hedge shears make cutting so much easier they ve earned the arthritis foundation s ease of use commendation. Turn your hedges into crisply manicured works of art with the Corona Hedge Shears. These ergonomically shaped clippers feature a honed blade for accurate, efficient cuts. Dimensions: 9.72W x 23.25D x 1.6H in.. Ergonomically shaped soft grips. ShockGuard bumpers. 9 in. blade with 8 in. edge. Comfortable non slip grip. Dimensions: 9.72W x 23.25D x 1.6H in. CARBON STEEL BLADES - Premium grade steel blades make trimming hedges, bushes, and shrubs easy. SOFT RUBBER HANDLES - Heavy duty, ergonomic, soft-grip handles provide the ultimate in comfort. SHOCK ABSORBING - Rubber impact bumpers soften each clip for the smoothest possible cutting. CURVED BLADES - The curved knife edge design prevents slipping when pruning branches. HEAT TREATED - The steel blades are surface polished and heat treated for maximum durability and lifespan. USAGE.This hedge trimmer is the ideal tool for trimming and shaping your shrubs and decorative topiary plants. SHARP BLADE FOR PRECISION CUTS. The high carbon steel blades cut all the way to the tip and produce smoothly operated crisp cuts. COMFORT GRIP WITH SHOCK GUARD.The rubberized grips on handles provide comfort and good grip. SHARP AND STURDY.The high hardened carbon steel blades will stay super sharp,even after some heavy use!Ilaflon coated blades can be re-sharpened. AFTER-SALE SERVICE.If you are not satisfied with our lopper,you can return our goods in 3 months. 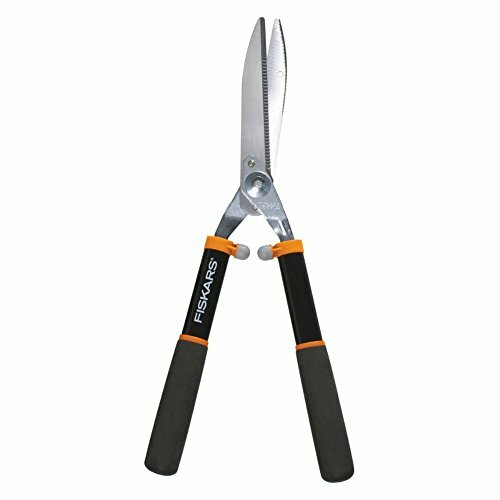 Every gardener or somebody who has a garden is pursued a premium durable and comfortable and safe pruners. Wsiiroon pruning shear's design is for garden trimming made much easier the edges cut through thick branches with little effort, made for gardening and pruning your shrubs, cannabis, plants, or bonsai trees. 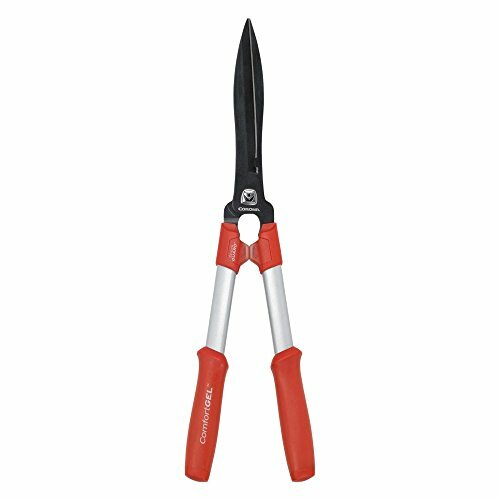 The coated steel blade have strong sharp blades that make for very comfortable pruners. The non-slip grip handles are simple and has unlocking spring mechanism for effortless easy cutting. Easy to use. 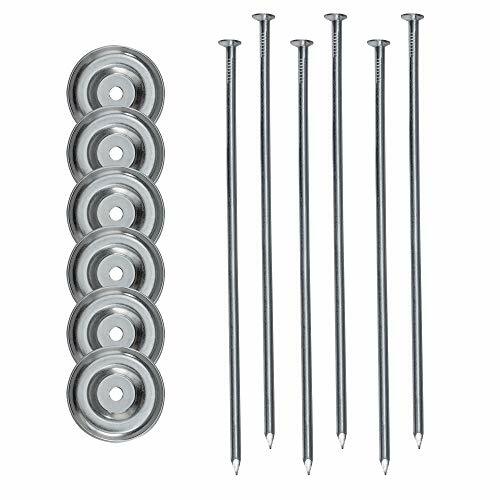 Rust and corrosion resistant polished Titanium steel provides excellent durability for long-lasting value. This reliable pruner is ideal for a variety of general pruning tasks. This make anti-rust and make cutting easier, helping blade glide through wood, prevents the blades from gumming up with sap and debris and helps the blades resist rust. Simply wipe with a well-oiled cloth after use to keep your garden shears in tip-top, corrosion-free condition. 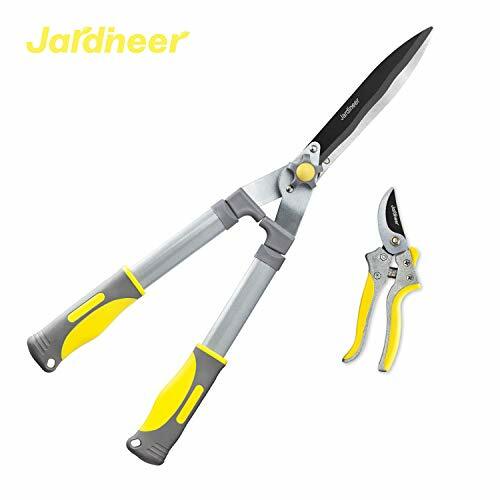 Easy-open safety lock makes garden pruning much more convenient and easier, protects the blades during transport and storage. The handle has ergonomically designed, lightweight and comfortable, can help you ease impact and protect the hand and wrist, reduce the hand soreness caused by prolonged use. HIGH QUALITY TITANIUM STEEL BLADES Wsiiroon garden clippers blade is made of rust and corrosion resistant polished Titanium steel, which is more durable than other similar traditional hand pruners, and help your garden tool stay sharp longer. COMFORTABLE & DURABLE The handle has ergonomically designed, lightweight and comfortable, can help you ease impact and protect the hand and wrist, reduce the hand soreness caused by prolonged use. Meanwhile, as well as the blades, the body and spring of the shears is made from sturdy steel, which means our shears are both lightweight and robust. MULTIFUNCTIONAL and WIDELY USED Wsiiroon pruning shears have classic bypass design, compact enough to use indoors on house plants, can cut up to 3/4 diameter size tree branches, best for cutting and trimming small branches, shrubbery, snipping flowers and floral plant. SAFE & CLEAN Wsiiroon pruning shears has a safe hand lock, which can be operated conveniently in either right or left hand use. When not in use, the locking clasp will protect the blades from damage ,making them safe to store or take without injury. Special sap groove design, prevents the pruning shears from sticking by channeling off sap and saves time to keep the blades clean of debris after cut. 100% SATISFACTION GUARANTEE Wsiiroon pruning shears comes with a 100% Satisfaction Guarantee. We specialize in the best products and service, commit to providing a 5 star experience to all customers! We welcome all feasible advises and review from customers. It is kindly warned that any products from other stores are not genuine for which we will take no responsibility if there is any quality problem. VOBILLOW gardening tools value the user experience and continue to enhance quality. We guarantee high-quality materials and are always innovating to provide value for the user. Excellent service management and quality control provide a superior shopping experience for the consumer, and an improved after-sales system can resolve any problems with our products. Between the knife blade and handle is a reasonable curve to make pruning easy and convenient. Effectively resists evasive branches and prevents them from moving during pruning. The blade has a loosening and tightening trimmer button, rotate the button to adjust the space between the blades and achieve better usage effects. Product Maintenance: After using the shears, remove dirt and objects from the blades. Use a cotton cloth or sponge to wipe scissors cleaning oil on the entire surface of the blades. When not using the shears, at intervals of 2 months, you should put a few drops of scissors oil on the knife blade. This can maintain the long-term sharpness of the knife blade and keep it as good as new. Sharp and Durable: Thickened blade edge design, multi-tempered, high-level hardness, very tough. High-temperature heat treatment, will not easily warp or crack, long lasting and durable, 9-inch wavy edge, finely ground, shears are sharp and level. Suitable for hedges, weeding, pruning, and forming bonsai, protruding design, save time and effort while pruning. Teflon Coating: The blade has a Teflon coating to prevent rust and reduce shearing friction, prevent corrosion and oxidation, enhance wear resistance, reduce clinging dirt and make maintenance convenient and easy. Adjustable Grip: Hold tightly on to the handle and twist it counterclockwise, then it will loosen. 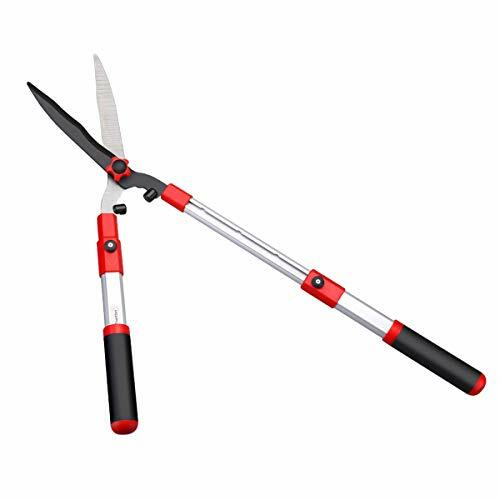 After adjusting the handle to a suitable length, twist it clockwise and tighten the handle can extend to a maximum length of about 31-inch, and can efficiently and quickly prune both delicate and rough branches. The black matte finish is beautiful and durable. Anti-excessive Contact: Effectively prevents the blade from jamming or breaking due to excessive force during use. Rotate the adjustable knob, adjust the space between the blades, you can achieve better usage effects based on different situations. VOBILLOW 1 year warranty: If there is any quality problem in the normal use of the product within 1 year, you can replace it with your new one for free at any time. If you have any questions or suggestions, please contact us via VOBILLOW shop. We will reply to solve the problem in time. 1.TELESCOPIC HANDLE FOR EXTRA REACH: The handles can be adjusted and securely locked at the perfect length (15.7"/18.5"/21.6"/24") for pruning hard-to-reach branches or twigs,Easily cope with large hedges. 2.SHARP WAVY BLADES FOR PRECISE CUTS: Hardened steel blade feature wavy cutting edges and special rust-resistant non-stick coating to trap twigs and stems while cutting without gumming up with sap and debris Stopping the twigs from sliding off. 3.LESS EFFORT, MORE COMFORT: Our shears minimize your arm and wrist fatigue by the ergonomically angled blades,The shock absorb design and lightweight aluminum handles brings a responsive comfortable stop to your cutting action. 4.TACKLE VARIOUS GARDEN WORKS: The tension of blades are easily adjusted with the tension control pivot to eliminate weeds, trim borders, shape hedges, cut back perennials, tame soft plants and do topiary. 5.EASY TO USE: Strong tension control pivots adjust blades for cutting different plants effectively and reduce blades wear; allow a great cutting performance and smoothing cutting. TWIST AND LOCK EXTENSION - The telescoping aluminum handles have a twist lock at the bottom to extend the reach an additional 7.5". ULTRA STRONG EDGE - The 8 long carbon steel blades have a wave shape to grip small branches. SPECIAL FEATURES - Sap-resistant non-stick coating on the top blade, ergonomic head, and anti-slip rubberized grips, with a star-shaped thumb-knob to quickly adjust hinge blade tension.